These products form part of Kynoch’s unique Efficient nitrogen solutions. KynoPlusTM was the first in this range of products introduced into the Southern African market and curbs potential volatilisation losses typically associated with urea. KynoPlusTM Super and KynoPlusTM Ultra had been introduced recently and also curbs volatilisation losses, but in addition also reduces the potential nitrogen losses typically associated with nitrification and leaching. Kynoch has been a leader in bringing innovative technologies to the local farmer when it introduced nitrogen stabilizers to the market. As exclusive distributor of patented Agrotain®-technology supplied by Koch Agronomic Services , Kynoch introduced KynoPlusTM to the local market. Since 2010 the results seen when applying this technology that reduces nitrogen volatilisation has been astounding. 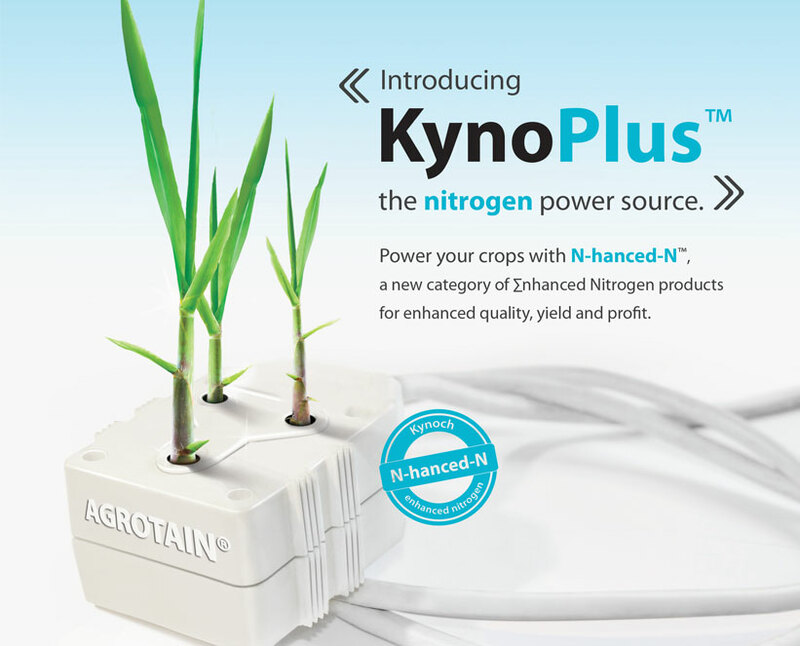 KynoPlusTM was only the first product in a range of N-hanced-NTM nitrogen fertilizer blends that controls nitrogen volatilisation, nitrification and leaching. AGROTAIN® nitrogen stabilizer products help secure your nitrogen investment. When untreated urea or UAN is surface-applied, on average soils in average conditions up to 40% of the urea-based nitrogen can be lost. By using enhanced efficiency fertilizers, like urea treated with AGROTAIN® nitrogen stabilizers, you can help guard against costly nitrogen loss. KynoPlusTM (granular urea treated with Agrotain®) and UAN PlusTM (UAN treated with Agrotain®) are ideal products as you are able to apply your nitrogen, whilst having peace of mind that the nitrogen applied will not “evaporate”. KynoPlusTM Super and KynoPlusTM Ultra is Urea treated with a different Agrotain® additive with the additional benefit that, in addition to curbing volatilisation losses, it also reduces the potential nitrification and prevents leaching of nitrogen. It doesn’t happen every day that nitrogen fertilizer and profitability have the same solution. South African soil is generally very low in organic material, resulting in very low nitrogen supply. The organic matter, as well as certain fertilizers must first be broken down further before it is used by plants. During this conversion, loss of nitrogen can occur through volatilization and leaching. The high removal of N as well as low nitrogen supply from the soil means that there is much more nitrogen applied per hectare than any other nutrient. From a financial and enviromental point of view, it is imperative that the effectiveness of fertilizer should be increased. Fertilization typically makes out 25% to 30% and even as high as 35% of the input costs of grain crops, whilst nitrogen typically makes out 55% to 65% of fertilization costs. If the efficiency of nitrogen can be increased, it will save costs and will result in greater profitability. A higher yield with the same quantity of fertilizer, or the same yield with less fertilizer obtained. Besides increasing the efficiency of fertilizer, more attention should be given to the “headland price” of fertilizer. Don’t just look at the price per ton of fertilizer, but also at the price per kilogram of nitrogen on the headland. Transport costs, and consequently the concentration of nutrients in the product, play a very important role. Higher concentration products can save more than 50% on transport costs. KynoPlus™ concentration is of the highest, which results in some of the lowest transportation costs per hectare. Benefits such as a greater return and lower input costs, which result in higher profitability, can be achieved if the right fertilizer, like for example KynoPlus™, is picked. Such a product is KynoPlus™. The liquids alternative to KynoPlus is called UAN Plus™. KynoPlus™/ UAN Plus™ is treated with a sophisticated urease inhibitor called Agrotain®. With KynoPlus™ / UAN Plus™ volatization potential is drastically lower than other nitrogen fertilizer. The volatization of nitrogen compared to KynoPlus™ / UAN Plus™ can be seen in a couple of days, after application. This technology means that KynoPlus™ / UAN Plus™ compares extremely well to other nitrogenous fertilizers with regards to volatization. This increased efficiency has created a worldwide increase in yields. Apart from the possible higher yield, KynoPlus™ / UAN Plus™ also creates lower transport costs due to the high N content. KynoPlus™ / UAN Plus™ will make a contribution to increased profitability by increasing yield / lowering nitrogen fertilization cost and reducing losses to the environment.